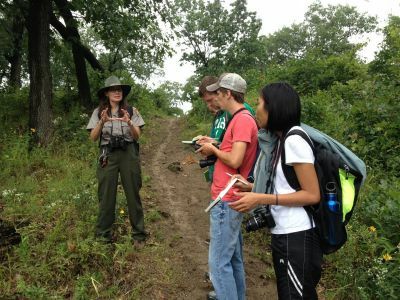 In Professional Field Studies we travel throughout the region to introduce students to a wide range of programs, nature centers, pedagogies, leadership styles and management strategies in environmental education. We also investigate critical issues in environmental education and the decision making process that will effect them, as educators, throughout their career. Two to four faculty travel with the cohort to investigate the interdisciplinary nature of environmental education, and the variations that environmental education may take. Each student develops professional connections, practical resources, and, through written reflections, an understanding of environmental education in the broadest sense. Masters of Environmental Education field study in Washington, D.C.
Past field studies have included Indiana Dunes National Lakeshore, the Dunes Learning Center, Kalamazoo Nature Center, Grand Rapids School District, as well as overnights in Chicago and Detroit to see urban garden programs, museums, faith based nonprofits and the greenest synagogue in the country. We visit leaders and planners in local cities, Indiana legislators or state parks. The cohort also spends a weekend at the Environmental Educators Association of Indiana Conference. 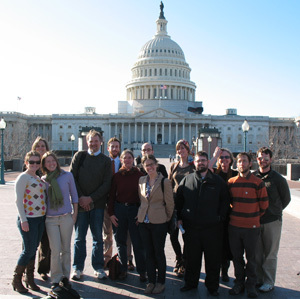 In March we travel to Washington, D.C. to investigate national issues by meeting with nonprofits such as the Natural Resource Defense Council or The Nature Conservancy, as well as legislators, various entities within federal agencies and staff from branches of the White House.